WHAT IS IT? I really wanted to use this top coat with the big green, blue and black hexagons and thought well this is the best to create a pattern with it, you just have to place all hexagons seperately. And as my rainbow toe nails where ready to be renewed I did this on my toes. WHAT IS USED? I used the new 890 lost in paradise by p2 as a base. 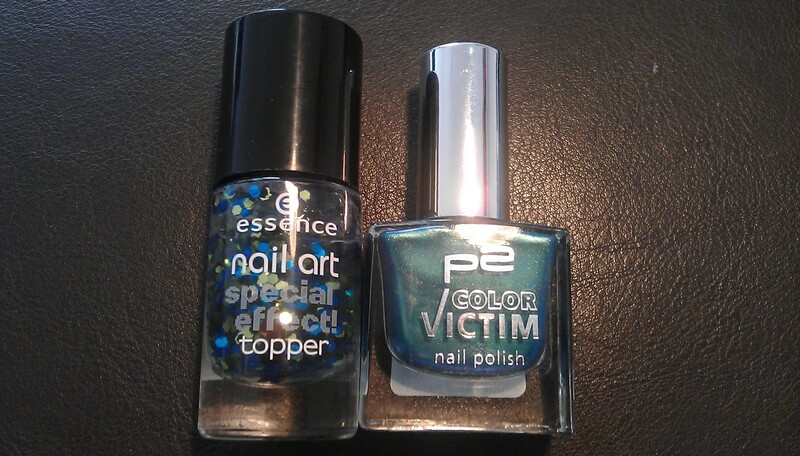 The picture here doesn’t do it justice: it is a super nice shimmering polish which shifts from turquoise to gold. I would have called it “mermaid” as this is what it reminds me of. Then I put some brushes full of glitter (Catrice, 13 mrs and mr glitter) on a sheet and started placing single hexagons on my nails with the help of a pencil. HOW DOES IT FEEL? Well, I think it looks a bit like bling jewelery as the one below. It does look like summer and draws my eyes to them again and again but I think they won’t last as long as the rainbow nails did. This entry was posted in Nail Art and tagged 31 day nail challenge, essence, glitter, lost in paradise, mrs and mr glitter, Nailpolish, P2 by kathatravelling. Bookmark the permalink.